The Toronto Maple Leafs have been one of the NHL’s top teams for the better part of the 2018-19 season. They have the league’s fifth-best record (yet sit third in their division because the format is questionable–but that’s a rant for another day), a standing which is largely powered by an offense that ranks fourth in goals for. With two games left in the regular season, the Maple Leafs haven’t hit the final leg of the season in stride. They’re 6-6-3 in their last 15 games while being outscored 56-47 over that stretch. For a team with so much regular season success, Toronto has as many question marks as any team right now. Can they win a Cup with this defense? Who plays with Auston Matthews? Are they tough enough for their inevitable first-round matchup with the Boston Bruins? 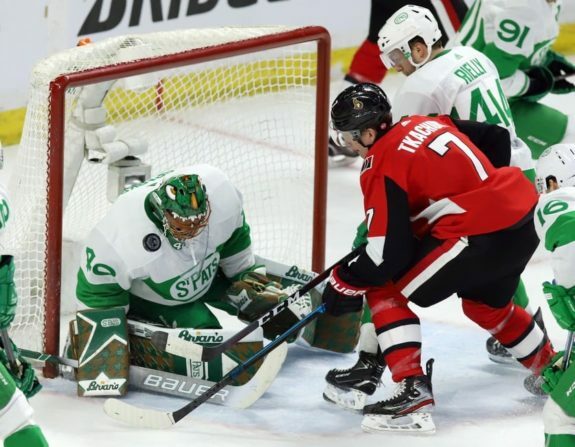 The one question that has popped up most frequently of late is: Can the goaltending hold up when the games matter most? The weird thing about the Maple Leafs’ recent stretch of underwhelming play is that the underlying numbers are very encouraging. In the last 15 games, they have outshot their opponents nine times. Their Corsi For over that stretch was 934 versus an 802 Corsi Against with an Even Strength Offensive Zone start of 52.3% (per Hockey Reference). Simply put, while it may not be reflected in the win-loss column, the Leafs have had the puck on their sticks more often than not and are routinely out-chancing the opposition. This is where the goalies factor in. Over the last 15 games, Toronto’s goalies have a collective save percentage of .887. Since the All-Star break, Frederik Andersen’s save percentage has been .910 in 24 games played. That isn’t horrendous by any means, but it is a far cry from the All-Star calibre .927 he was sporting in his 34 games prior. While it may not seem like the most important position in hockey, a strong back-up goalie can put a good team over the top. When a team is confident in their back-up’s ability it can buy the starter 25 to 30 games of rest. A good back-up can also mitigate the coach’s headaches when deciding who will start what game in a back-to-back. Garret Sparks’ first full season as Toronto’s back-up has not been one to remember. He sports an 8-9-1 record, a 3.15 GAA and the NHL’s 47th ranked save percentage at .902 (minimum 20 games played) sandwiched between Corey Schneider and Malcolm Subban. Among the 58 goalies who have started 20 games this season, Sparks ranks 51st in even strength save percentage with .906. It’s especially tough since Toronto chose to keep Sparks on their NHL roster and lost Curtis McElhinney on waivers to the Carolina Hurricanes out of camp. While Sparks has not inspired confidence for the Blue and White, McElhinney’s .912 save percentage in 32 games has been a godsend for a Hurricanes team that was in desperate need of stability in the crease. The most frustrating part of Sparks’ play is that he has shown real potential as recent as last season. In 2017-18 with the Marlies, Sparks was named the AHL’s Top Goaltender of the Season. At age 25, the Leafs brass felt his long-term upside outweighed that of a tailor-made back-up in McElhinney. from “Maple Leafs’ Garret Sparks: ‘This year isn’t over for me’” by Luke Fox, Sportsnet –2/4/19. At this point, we may not see Sparks get another start this season, but if Andersen gets hurt **knock on wood** Sparks will need to figure out NHL hockey in a hurry. When I call the goalie situation “the biggest question mark” on the team, I am not implying that it’s the team’s biggest weakness. The Achilles heel of the Maple Leafs is their leaky blue line and that has been evident from the get-go this season. The Leafs are a high Corsi team that caters to quick play up the ice, the only caveat is that the puck comes back just as fast the other way. With no real defensive standouts to suppress shots, there have been a handful of really ugly games this season. The Maple Leafs are second in Corsi For per 60 minutes with 64.57 chances but are second to last in Corsi Against per 60 with 60.16 (per Corsica). For better or worse, this fast and loose style puts a huge amount of pressure on the goalies’ shoulders. If they aren’t up to the task, prepare to get buried in goals. Up to this point in his career, Andersen has proven to be up to the task. In the two seasons prior to this one, he started 132 games for the Leafs with a .918 save percentage. Last season, he saw more shots than any other goalie in the league. His .918 save percentage this season lines up well with his career output, but it’s just this recent string of league-average play that has Maple Leafs fans understandably uneasy. It doesn’t help that Andersen has been battling a groin injury since December. People speculate that the herculean workload finally caught up to Andersen and that his recent slide can be attributed to not being 100% healthy. Healthy or not, it would take a serious injury to take him out of the net from here on out. It doesn’t seem fair that the Maple Leafs need borderline Vezina numbers from Andersen in order to succeed, but this is the reality we live in. Nobody’s going to wave a wand and fix the blue line with two games left in the regular season. 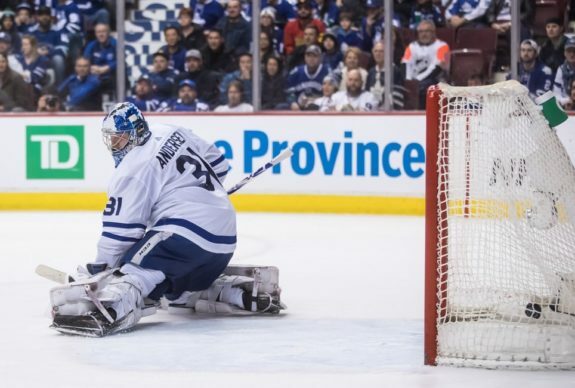 The reality is that Toronto will only go as far as Andersen can take them. Maple Leafs fans can just hope that he has a Stanley Cup run in him.